College can be debt-free. It can be affordable. Private universities can be less expensive than public universities. And a 4-year degree can cost less at a university than homeschooling college or paying for community college. Are you surprised? It’s true! You can be successful at finding college scholarships even if your children are “normal” kids. The key is that you have to start thinking about scholarships now, when your children are in middle school or early high school, so you can start some simple projects that will pay huge dividends. I know this can pay huge dividends because it happened to my family. We saved a few thousand dollars for college, but other budget and family priorities came first and we knew it wasn't going to be enough. Even with our modest savings, both our boys graduated with 4-year bachelor degrees from their first choice university with ZERO college debt. Neither child had to work their way through college, even though they held jobs. Both of our children were academics, but they did not excel in sports or have anywhere near the volunteer hours they should. They weren’t super social, merely sweet, ordinary, loveable, nerdy guys with some interesting and unusual passions (chess and economics, if you must know). 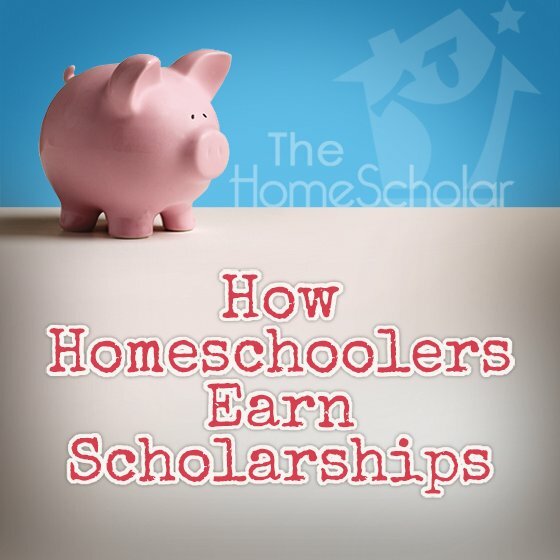 You can earn scholarships, even if you have humble homeschoolers. Let me explain how. The first is need based financial aid related to the FAFSA that you fill out during October of senior year. Awards are given as grants and loans. Loans have to be repaid; they are not a gift of cash. Financial aid may include work study, such as a minimum wage job working for the school (in the cafeteria, for example and may not pay well). These scholarships are first come, first served. Need based scholarships may be somewhat helpful even if you are a middle income family. Learn about these scholarships so you can determine if they will be helpful. In my family, our children could have received about $2500 in need based financial aid. 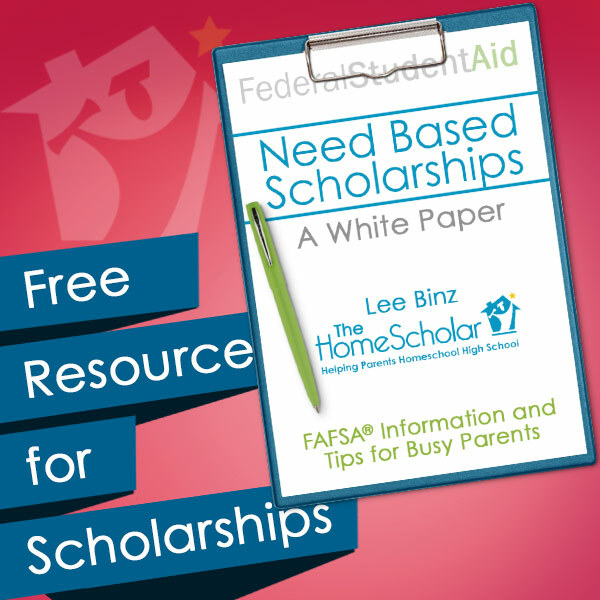 Get up-to-date information on need-based scholarships and the ever changing FAFSA in my free resource, "Need Based Scholarships - A White Paper." It’s filled with tips for busy parents who dread filling out government forms. The second kind of college scholarship is the private financial aid your child can earn from businesses or through special applications. You can search for scholarship opportunities given for special talents or abilities, often also involving a written essay or project, submitted with thorough homeschool records. There are many unused scholarships, and the awards vary from small to huge amounts. The third kind of college scholarship is the merit based scholarship a student receives directly from the college when they apply. These can be automatically awarded, based on SAT, ACT, or GPA. This is why homeschool parents should provide grades in all classes, so your student has a GPA on which to determine scholarships. They may give scholarships related to special skills or talents you explain in the application process. Merit based scholarships are often the easiest to get when you know the simple strategies. These scholarships can make the biggest financial impact for your family, even if your child isn’t an Einstein. In my family, our children received great scholarships from all colleges applied to, and were given over $184,000 in scholarships to our first choice college. To earn a merit scholarship, you must convince a college that your child is worthy of a merit scholarship. Convincing colleges comes from what I call “clipping college coupons.” You know how you save money on groceries by clipping coupons and shopping ads? The same is true for colleges. You can convince colleges you are worthy of merit scholarships by "clipping college coupons." These coupons are the many small things colleges request in order to award admission and scholarships. There are 9 “coupons” you can clip to reduce college costs and increase the chances of college admission. Each represents a different strategy that will convince a college that your child is ready for college, and will benefit the college. This is how you convince colleges your child is academically ready for college level work. With 30% of college freshmen at the remedial level, simply showing your child is prepared can go a long way. Provide core classes and go beyond expectations by including delight directed learning for your child's electives. Proof of academic preparation begins with a professional, easy-to-read homeschool transcript. Colleges need a short document that is easy to read for a quick "yes or no" answer to the question, "Do they meet the requirements?" The transcript provides this quick overview in one page. Once a college sees that a student meets the requirements, they look for additional proof of academic preparation. Thorough course descriptions for each class help colleges check the academic rigor of your homeschool, in order to make sure your child is academically prepared for college level work. Help your child get their best possible test score on the SAT or ACT. Consider subject tests, such as SAT Subject Tests, AP, or CLEP, to provide additional outside documentation through tests. They don’t have to out-score everyone in the world; they merely have to get the best score they are personally able to achieve. Some colleges give automatic scholarships tied directly to test scores. Preparing for tests, rather than taking tests cold, can earn your child the next level of scholarships. Colleges want students who will graduate and get a job, so they look for students who are self-aware and eager to prepare for a career. Genuine activities can demonstrate interests that will lead to a career in the future. Be sure that the extra-curricular activities that demonstrate your teen's true interests are reflected on your child's transcripts and records. To get a scholarship, your child needs to demonstrate an interest in the college, and not merely apply. Demonstrating interest takes time. Colleges know that if your child has spent some time on campus, they are truly interested. If accepted, a child who has visited is more likely to attend. Show that your child truly loves the college they are applying to and is likely to stay for all four years. Convince the college by including the details of your visit throughout the application process. College admission counselors are real human beings with busy lives, like you and me. The easier you make their job, the more they like you. The harder you make their job, the less likely they will provide scholarships. Apply early, when they are less swamped with applicants and their job is less stressful. Don’t miss a single deadline. College applications have inflexible deadlines, so try to complete all of the pieces of the application one month prior to the due date. Believe it or not, even colleges know it’s not all about test scores and GPA. They know there are intangibles that students bring to the table. They want to see great letters of recommendation that can speak to leadership, work ethic, and character qualities. These should be professional letters from someone outside the family who knows your child well and can write well. This is another reason why activities are important, as your teen will need them for a source of recommendation letters. A perfect college application essay is a self-reflective, technically perfect, first-person descriptive essay. It answers the essay prompt, and is clearly written by your teenager. I know, I know ... that’s the hard part. You can’t write the essay for them, but you can make it more palatable by including application essay practice during junior year, so they become more familiar with how to write them. You can see how you have complete control over some of these coupons as the parent. You don’t have a lot of control over everything about your child. You can’t always make your child write well, test well, get a job, or suddenly become extroverted. But there is one thing you can control; you can always provide outside documentation with thorough homeschool records. All of these kinds of outside documentation are awesome, but who is ever going to know about them if you don’t share them? They all need to be included in your student’s college application, and most of them need to be included in your student’s records. 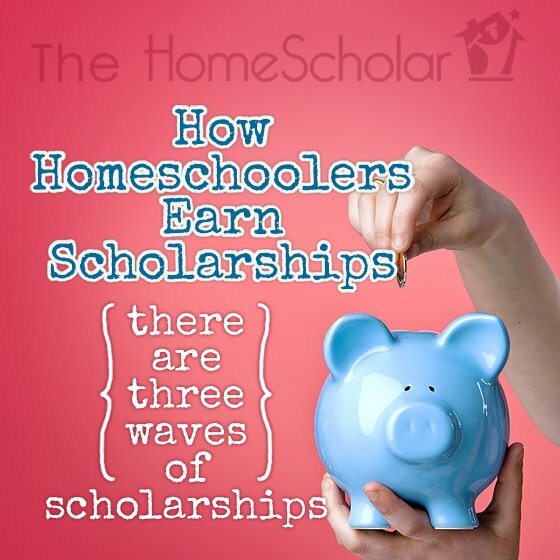 With all of this information in mind, here are three of the most important tips for homeschoolers in need of scholarships. Apply for colleges early in senior year, and complete all applications well before each due date. I suggest trying to beat deadlines by two months, or finishing everything before Thanksgiving. This means you need to have all the pieces of the application ready to go, which requires you to pay close attention to all those “college coupons” I talked about. Most financial aid is first come, first served. You want to be first in line when they are handing out the cash. Apply to a mix of public and private universities. Public colleges are often cash-strapped, with few available scholarships. Private schools may be well funded, with larger scholarships. In my experience, public and private universities are often the same price after financial aid is given, so make sure you include a mix of colleges. In my family, one private college offered a full tuition scholarship and said it was their top scholarship. The public university offered my son merely a few hundred dollars per quarter, and said it was their top scholarship. Choose some "reach" schools. These colleges have higher average test scores than your child, but they meet the college requirements. Ivy League and military academies are always reach schools, no matter how high your child’s test scores may be. Choose some "fit" schools. These colleges' test scores are about the same as your child’s, and they meet the college requirements. Choose some "safety" schools, as well, where your child’s test scores are higher than the college average, and they exceed the requirements. During senior year, scholarships do not arrive all at the same time. Instead, they come in waves that roll in over time. The first wave is scholarship money based on application numbers. This means the score on the SAT or ACT, and GPA. The second wave of scholarship is based on the FAFSA and what the government considers your financial need. The third wave involves the scholarships children get that are based on special merit or skill. Scholarships rarely arrive when it's convenient. The most difficult time for parents that need financial aid is the spring of senior year. At this point, your child has been admitted to college and has their heart set on their first choice university, but because all the scholarships haven’t come in yet, the parent has absolutely no idea how they will pay for that college. Scholarship money is available for almost every college applicant. Some students will win huge merit scholarships. 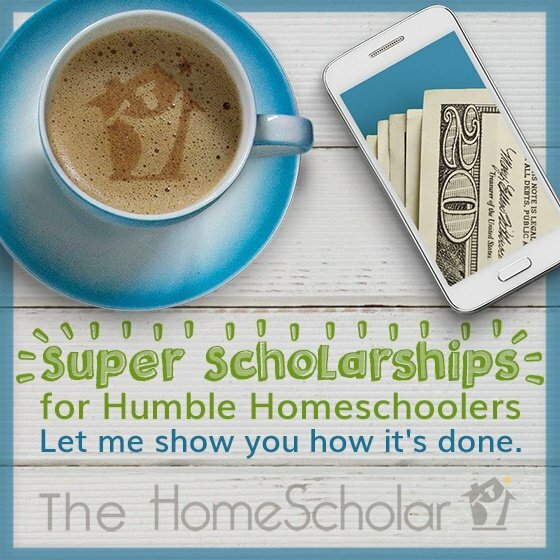 Your humble homeschooler can earn great scholarships. 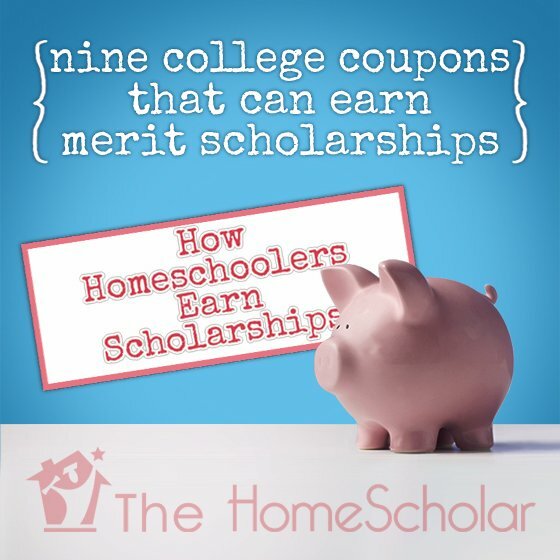 It simply requires you to invest some time and energy into “clipping college coupons.” Follow these concrete steps to increase the odds of your child receiving scholarships. 1. "Need Based Scholarships - A White Paper: FAFSA Information for Busy Parents"
Copyright © 2017 The HomeScholar LLC, www.HomeHighSchoolHelp.com. Text may be reprinted without permission if used in full, except for use in a book or other publication for rent or for sale. Reprint must include this copyright, bio (below), and the original URL link (https://www.homehighschoolhelp.com/how-homeschoolers-earn-scholarships). 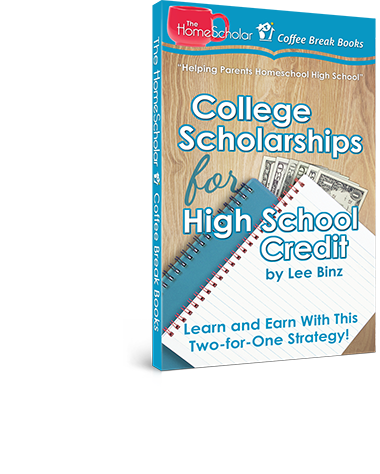 College Scholarships for High School Credit: Learn and Earn With This Two-for-One Strategy! As the parent, you can do a lot of the legwork for scholarship applications, but your student must ultimately write the paper or produce the product. Learn how to find, filter, format, and follow through with scholarship applications that can count for high school credit and hopefully, college scholarships too!